Coz at Santa Anita, February 19. Photo by Mike Sekulic. What is the single thing you look for in a young horse that tells you he or she is ready for more serious work? A:If a horse has had a hard workout and ‘cools out’ quickly—his respiration returns to normal, he is not overheated or stressed, and he is drinking a normal amount of water—this is a great indication that the horse is ready to do more. 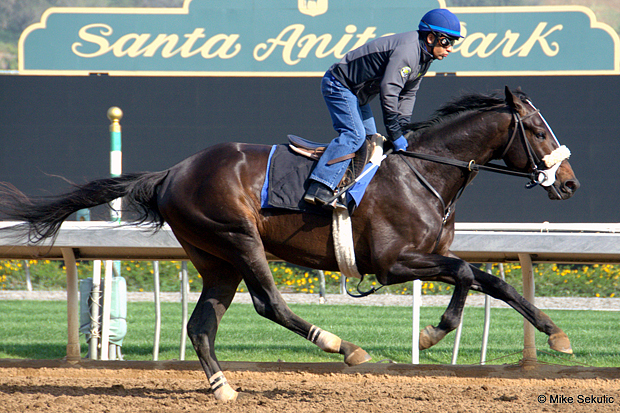 In the photos of Cozmic One in training, what is the white device he is wearing in addition to his bridle? A: He is wearing a Shur Win bit holder. The purpose of this is to hold the bit higher in the horse’s mouth. It is a great alternative to a tongue tie and allows the horse more freedom with his tongue. Coz is very comfortable with this. Dear Dottie and John, with the two of you always so terribly busy, did you have time to do something special for Valentine’s Day? A: Thank you for asking. We had a very special dinner at one of our favorite restaurants. Sophie also enjoyed her day. She loved it when we came home carrying a ‘doggie bag.’ All TOO CUTE! ♥ If anyone would like to see Chrome’s workout today. Scroll down to find the video. Love this guy and have real fears about him going to Dubai. Safe trip and the best of luck to him there. You all must go to Bloodhorse.com and read Cot Campbell’s blog. If it doesn’t make you laugh, you gotta real problem. A service was held at St Paul’s Cathedral today in honour of our fallen heroes in Afghanistan and to mark the end of the conflict.Her Majesty,other members of the royal family and Prime Minister David Cameron led the nation in remembrance.These young men and women who died will never be forgotten.They paid the ultimate sacrifice.RIP.Sheena. In the silence I remember.